4K Active HDR delivers consistently top-notch picture quality. 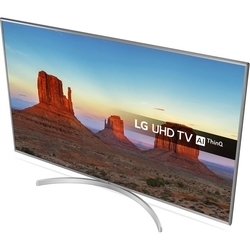 Smart TV webOS to navigate your viewing choices effortlessly. ThinQ AI and Google Assistant accommodate your smart home and lifestyle. DTS Virtual: X ensures you hear even a pin drop. Watch your screen come alive on the LG 65UK6950PLB 65" Smart 4K Ultra HD HDR LED TV. HDR boosts the contrast of on-screen images, so you can see the detail in the brightest and the darkest scenes. Whether at the edge of your seat in the middle of a football upset or cuddled on the sofa for romantic binge-watching with your partner, the 65UK6950PLB's 4K Active HDR innovation literally doctors every image of every scene so you can appreciate pinpoint picture quality. Added to this precision viewing is the latest 4K Ultra HD technology built into the LG panel, which basically means regardless of the angle you're watching from, you see vibrant, distortion-free pictures.